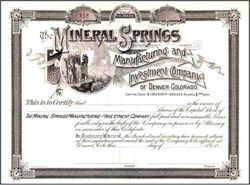 Beautifully engraved unissued Certificate from the Mineral Springs Manufacturing and Investment Company . This historic document has an ornate border around it with a beautiful vignette of indians over looking a canyon. This certificate is over 110 years old. 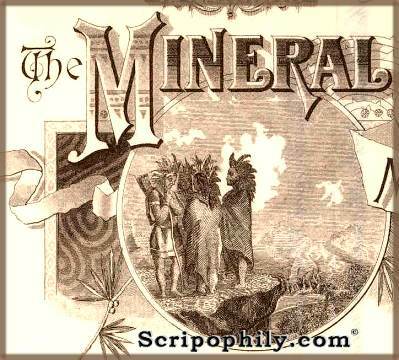 In the bio of James Lord, there is a reference to the Mineral Springs Manufacturing and Investement Company prior to the outbreak of the Civil War. James Madison Lord was born in Stafford, and there he began his education, which was continued in the Academy at Wilbraham, Mass., for three terms. When he was seventeen, young Lord went into the freight office of the Hartford, Fishkill and Providence Street Railway, where he remained but a short time, taking a place in the finishing room of the Mineral Springs Manufacturing Company, where after a year of faithful work he displayed such readiness that he was made foreman of the finishing department, serving in that capacity two years. After this Mr. Lord went west to Lane�s Station, Now Rochelle, Ill., and was engaged in a wholesale grain business, running a large warehouse, as a member of the firm of C.P. Spaulding & Co. For four years he was in this business at Rochelle, and there the outbreak of the Civil war found him, and in response to the need of the Republic he enlisted Sept. 3, 1862, for three years in Co. A, 2d Ill. Vol. Cavalry, serving in the commissary and ordnance department. His command was ordered into Tennessee, and from there to Vicksburg, and Port Hudson. Mr. Lord was in much hard service, and saw the brunt of the fighting in the West, being mustered out June 11, 1865.